For starters, another word of warning: 'Mid' Wansdyke is even less pronounced compared to West Wansdyke, even worse: it is not even that sure this was part of Wansdyke AT ALL! So why do I mention it, let alone give it that much attention? Well, that's easy; I'm not so sure that it is NOT Wansdyke. I'll take you through the arguments briefly. The reasons to disqualify this section as part of Wansdyke are very straightforward. To start with, there's no sign whatsoever of a ditch, just a bank. In fact, we can be absolutely sure that this was the ancient Roman road from London to Bath, and the bank really is the agger or raised course of the Roman Road. This means no defensive structure exists here. Even worse, as Anthony Clark has rightly argued, any defenders would have been trapped by the Avon at their backs had any enemy attacked here. 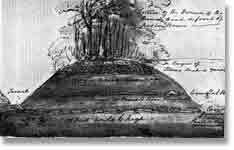 Which means that this part, if ever belonging to the total scheme of Wansdyke, would not only have been indefensible, but probably unpatrolled as well. That would leave Wansdyke, if it ever existed here, being a demarcation only. 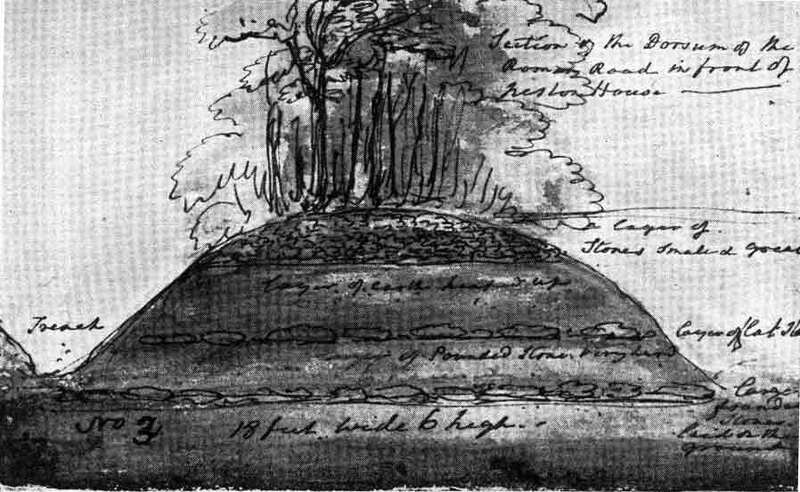 Nevertheless, as this 1819 sketch by Skinner of the Roman Road across Neston House shows (click here to enlarge), it seems quite easy to mistake the agger or bank of the road for a linear earthwork. This has happened elsewhere in Wiltshire (the Ackling Dyke). In my article about the relation of the Roman road to East and West Wansdyke, I discuss these problems at lenght. From Bathford across the plateau.. The start of this section bring us into serious difficulty. Though it has been accepted with as fairly certain that the Roman Road from Bath to London started at Batheaston, its course uphill through Bathford is obliterated. It may have followed the road to Ashley Wood, but upon reaching the steep hillside its course is unknown, without any sign of Wansdyke. Though Major & Burrow re-created a course along the eastern escarpment of the Avon valley, the parish maps show so much signs of quarrying that we may safely assume that any remains, had they been there, have long since been obliterated by industrial avtivity. At the crest of the Ashley Wood escarpment, in a point that forms the border between Somerset and Wiltshire, the former course of the Roman Road is known again. However, do not expect to find any signs of it, apart from those visible to the expert field-walker and archaeologist, or maybe when the light is favorable. 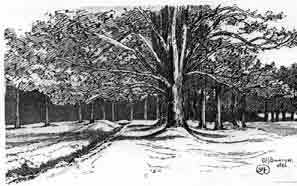 The Roman Road now heads east in the usual dead straight line, along the north edge of Kingsdown Plantation, where a drawing by Burrow in 1925-6 showed a wall delineating its course. 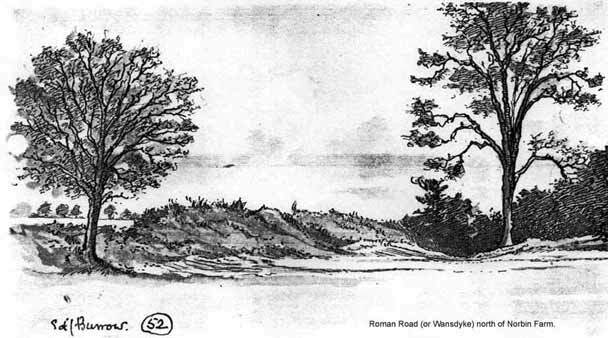 Only after crossing the Kingsdown  South Wraxall road north of Hazelton Wood, the agger of the Roman Road is visible for a very brief time north of Chestland Wood, as can be seen on this drawing of 1926 (click here to enlarge). From here, Colt-Hoare observed that it followed a trackway marked as Bulcot Lane, but which had disappeared by 1926. From Neston Park to Spye Park. The next visible part is above Norbin Farm, just west of the B 3109. From there, until it crosses the A 365 in a woodland adjoining Neston Park, the remains of the Roman Road are lost again, though Burrow claimed in 1926 he had encountered the bank standing as high as 12 feet cross the entrance to the once much larger park (Cottles Wood). As the modern Pathfinder map does not show it, I really doubt its survival. 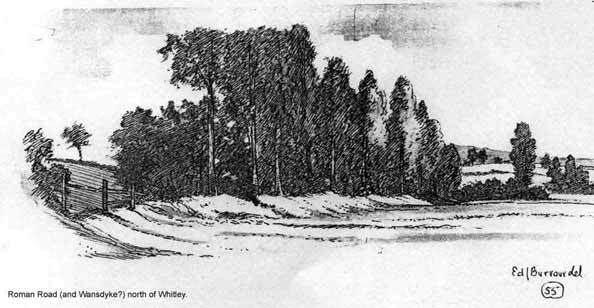 Further to the east, past Medleys Cottages, a bank can be seen again, though Burrow saw it still flanking the road between Atworth and The Ridge in 1926, as we can see from his drawing (click here to enlarge). Over the last part of this section, the Roman Road is invisible again, until it reaches the B 3353 from Whitley to Chapel Knapp. 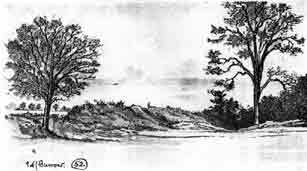 From here, it reaches considerable proportions on both sides of the B 3353 and remains visible for a few hundred meters, as can be seen from the 1926 drawing (click here to enlarge). This may actually be the best place to visit this stretch, especially the part between the B 3353 and the railway line, where the banks edges along a low hill. For the next mile signs are visible, until the route is crossed by the railway. Now nothing can be found until after the skirting of Inwood Copse, where some remains of a bank can be detected between the woodland and the A 350. 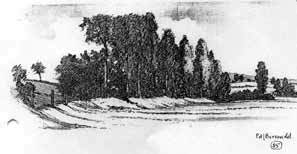 A bank to the east of the road, described by Burrow in 1926, is no longer visible. And here we reach the river Avon again, at a place once called Lydford, remembering the ancient ford that must have existed here for the traffic on the Roman Road. If Wansdyke in reality never followed the line of the Roman Road, but used the river Avon instead, here we should pick up its trail again. Directions to Section 5 can be found here. Follow Wansdyke further through Section 6.